Meanwhile on the vicinity Yuri and Megumi are arguing again because Megumi used Yuri´s sun block, while Yuri used Megumi´s Antiperspirant… The teacher says that before the incident both girls truly get along, of course that was until they found something they couldn´t share…The heart of the man they love! Meanwhile Yuria and Maria are seeing their times and it seems they where stuck in a loop with certain times, still now it seems they are starting to improve! And it´s all thanks to the fact that they are separate! Both girls start remembering that since forever they have been together and have liked the same things, their connection was a big one and the fact that both where so look alike it wasn´t much of a problem until… Something happened, something that make them decide to set them apart a little. Both start reflecting about their way separated, which included goofing around only the drivers or telling scary stories between the passengers, bathing and talking with different people, making different connections, it was scary at first, to be alone and separated from each other; but it seems everything is working out and going for the better. 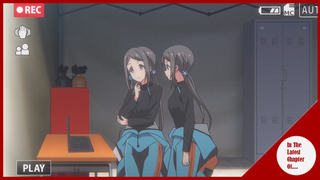 A new day has come and the Single Duet Duo is practicing, their times have improved; both Maria and Yuria detects that their movements are a Little different now, still they are a good match! Obviously being separated was the right choice! After the practice they can see how the other teams are formed of vastly different people, so yeah…while they are a team, being individual and unique is also important. So on the evening of that day both girls where looking at the sea, one of them was holding some scissors, they flipped a coin and one of them was chosen, she grabbed the scissors and started cutting her own hair. Later all the girls are taking a bath and everyone can see that Maria now has a different hair while Yuria has the same style as always everyone feel a little weird with the new Maria; but still they embrace her new look! Besides now it will be easier to recognize each other! Anyway It´s time for lunch! On the case of the twins one decided for Chinese while the other for Hamburger, still they had an agreement of sharing; but Maria wants to enjoy the whole meal, still she will give a gelatin to Yuria so it´s all good… Not like Megumi and Yuria who are fighting over a Hamburger. Meanwhile Mao and Hitomia re talking about Tea and it seems that Hitomi´s favorite tea it´s Mao´s… Honorable mentions? In any case let us keep going. The girls are talking and it seems that with the change of hair Maria looks now like the older sister, more grown up while Yuria it´s the little one a little more spoiled, not like that is something bad or anything! But they have different aura around them now. They have completed their objective it seems, Both start remembering how since little they where so look alike, they liked that attention they received from the people; but also they had a truly special connection. When one was happy the other was happy too, when one was sad the other cried with her. It seemed that would last forever…But adolescence came and they started looking at boys and realized that both girls where in love of the same man, what could they do? They wouldn´t want to share a boyfriend and also they don´t want to make the other to be sad because the man she is in love with will ended up with her own sister, obviously they decided to deny their feelings and the opportunity of having a special other; both girls cried for such fate….Although also a resolution came with them. They will change, they won´t be a exact copy of the other, therefore when the opportunity to love comes again surely the feelings of one won´t reflect on the other and for that their feelings won´t be broken or will have to make a painful choice again! Anyway, it´s time for practice and the Single duet girls are ready to rock! They get up on the bike and start! Their times are getting better, although both Megumi and Yuri can detect something… They aren´t one. Both girls start remembering an accident they had in a curve, they went off the tracks and while both girls weren´t injured their coach told them that while they can´t look at each other, nor they can hear each other… They must have a mutual understanding, like a single mind, a perfect synchrony. They had an accident, both girls are out of their bike and on the ground now. An Interesting chapter and one that threw a curve ball to us in more than one way! First I thought that the chapter would be more about the “SadoMaso” team since their stuff sort off left unfinished, so it was a surprise that we would go to the twins team. Second the chapter focused on sharing us their story; but also in how similar they are compared to our Heroines (except the looks) like they like the same food, the same clothes, the same shows and…Eventually (as this chapter has shown us) the same man; but still the way they acted about it and about different stuff it´s highly different in how Yuri and Megumi treat their stuff, which it´s arguing about everything, although we learnt also that they started being mean to each other when they realized that they were aiming for the same guy. Different in how Marian and Yuria decided to resolve their problems by being more friendly to each other and when they detected that they were in love of the same guy…That it was something where there it wasn´t any doubles or something they could or want to share, they decided to not having that guy in particular; but therefore will decide to distance a little in order to find themselves and stop being a double of the other so the next time one falls in love the other wouldn´t interfere or will be interested or will make the other sad. The third one it was that even though they gained and saw all of their efforts on being single individuals are being more and more visible, at the time of the race… This was their doom, they got too cocky and too confident on their individual thinking and ended up messing it up, and therefore an accident occurred to them, since from chapter one (and even on the opening) the phrase “We are always one” is one of the most important things on this series, that 2 individuals can be on terms and act as a single unit while on the track, so yeah in their personal quest of individuality they grew separated and loss on the race. Now, finally, I have a question and it is: Will we be seeing a follow up of this? Or will we be seeing another pair of characters? I guess we will know the next week!